This afternoon I stopped by Westside Lake to check out the bird activity. I only found a single wood duck in eclipse plumage, a pair of female mallards, and a female hooded merganser, but the dragonflies and damselflies (Odonata) were abundant and attracted my attention. Hi Monika - what a beaut the 8-spot is! Our 4-spot is a dull and dowdy critter by comparison. Your red one would be called a 'darter' Sympetrum sp over here - looks a bit like Ruddy darter with that obvious club at hte end of the tail but dunno if you gey them over there. The damsels are a pair, the females of some species have two colour forms. Not one I'm familiar with bbut if there are several blue species the pattern on the segment behind the thorax can give you a clue - our two similar species have a tree or the Honda logo as a simple way of identifying them. Check the eye and leg colour too. 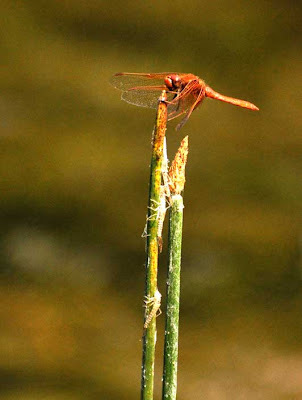 Our Ruddy Darter is S.sanguinium if that helps. The shed skins below the darter are from the damsels. Thanks for all the great info Dave. A lot of our local damsels have distinct patterns behind the thorax too - an exclamation point, or four dots, for example - but I wasn't really able to discern any of these markings. My dad's got a better field guide for Odonata of the region so I'm hoping he'll chime in! You're spot on with the dragonflies. The book I have doesn't cover damselflies much. 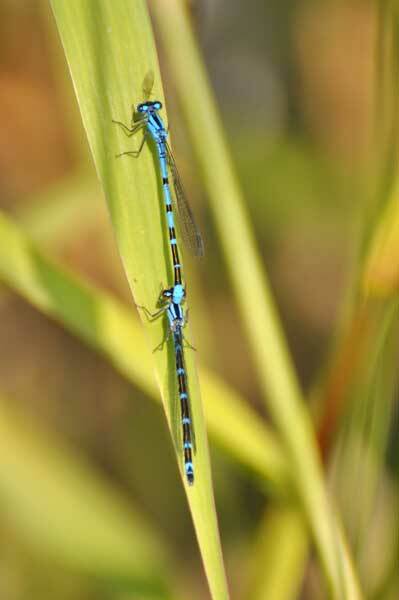 But the Familiar Bluet looks like a match -- likes ponds more than streams. Sorry not much more help. 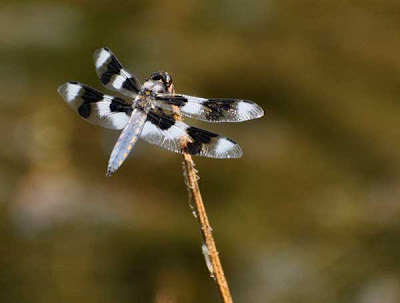 Warren - We also have a twelve spotted skimmer - I'll be on the lookout for that one! I'm not sure using video would be any easier than taking still photos of dragonflies...maybe I'll have to try it.